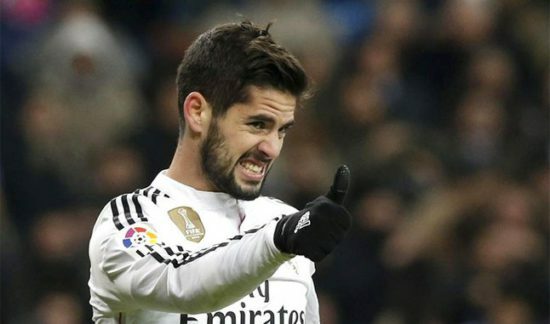 According to report from Daily Star, Manchester United are ready to make a summer move for Spanish international, Isco. The 25-year-old attacking midfielder is enjoying another fine season at the Santiago Bernabeu, registering 7 goals and 6 assists in 32 matches, and is the subject of reported interest from Manchester United and our bitter rivals, Manchester City. United boss, Mourinho is keen to add more attacking creativity and has identified the former Malaga man as the man to help us challenge for the Premier League next term. Sunday saw us lose to Newcastle 1-0, our fifth loss of the season that has seen us fall 16 points behind City. With Real Madrid being linked to PSG star, Neymar in a mammoth £357m, a number of first team players at the club may be let go to help fund the move. Isco, 25 is believed to be open to leaving Spain for a new challenge as he has won everything available in the Spanish capital. However, we face a fight for his signature as City are also prepared to match our offer. Like in the case with Sanchez, we can offer him superior wages but he could be lured to the Etihad to join up with fellow Spaniard, Pep Guardiola. Isco is a supremely gifted player known for his dribbling, vision and awareness. He was instrumental for his club’s run in the UEFA Champions League last term, and has currently made 223 appearances for the Los Blancos, scoring on 40 occasions. He will add more quality to our attack that often looks pedestrian.